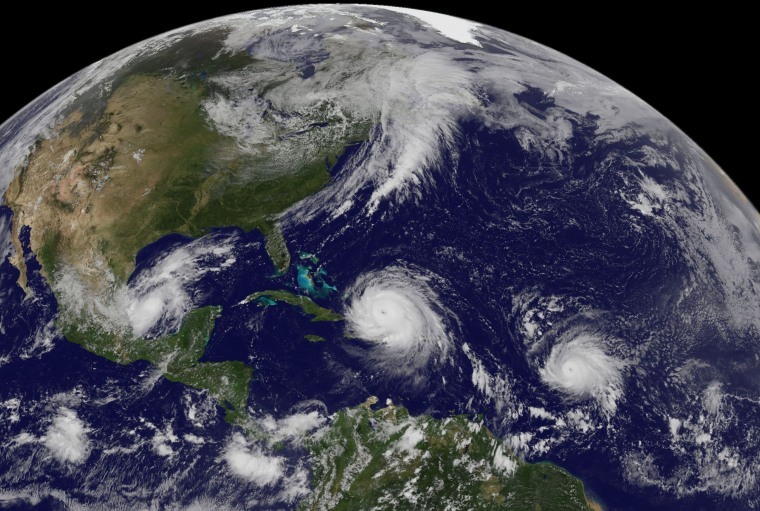 As Hurricane Irma churns in the Caribbean, two other storms loom not far from the strongest Atlantic Ocean hurricane on record. Hurricane Katia, in the southern Gulf of Mexico, threatens to hit the vulnerable Mexican coast as a Category 2 or 3 hurricane, possibly late Friday or early Saturday. It has winds of 80 mph and was located about 210 miles east of Tampico, Mexico. And a third hurricane, Jose, is growing far out in the Atlantic. It was no immediate threat to land, though the forecast track showed it could affect the Irma-blasted Leeward Islands over the weekend. Hurricane Jose has winds of about 90 mph. Irma, a fearsome Category 5 storm, cut a path of devastation across the northern Caribbean, leaving at least 5 dead and thousands homeless after destroying buildings and uprooting trees on a track Thursday that could lead to a catastrophic strike on Florida. No other storm in recorded history has maintained top winds of 185 mph for 37 hours. The Hurricane Center has predicted that Irma will remain at Category 4 or 5 for the next day or two as it passes the Turks and Caicos, parts of the Bahamas by Thursday night, and skirts Cuba on Friday night into Saturday.